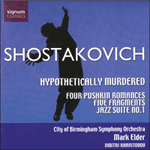 Nearly six years after Hypothetically Murdered, in the New Year of 1937, Shostakovich finished his Four Romances on Poems by Pushkin Op 46. From the very first notes it must be clear that this is music from another world, by a man whose musical language and whose message have profoundly changed. Gone is the wild satire and outrageous sense of humour, and gone is the enthusiastic energy of youth. These Romances are music of mature seriousness, dark with sorrow and stripped of superficial effect. The previous year, 1936, had been the grimmest of the composer's life. Although he had physically survived the assaults and threats from high and low, the destruction of his livelihood and his reputation, he was, not surprisingly in a profound state of shock. For the latter part of the year he hardly wrote any music at all. Like so many others in his country, he seems to have been overcome not only by the personal danger in which he stood, but also the realisation of the madness that had possessed the entire society to which he belonged. He remained virtually silent until, in the last days before the New Year, he suddenly gave voice again, on the pretext of an anniversary, four poems by the greatest and most humane of all Russian writers, Alexander Pushkin. These poems, as a quick reading even of a crude translation will make clear, were evidently chosen to reflect the composer's feelings about his own particular situation, as well as the situation of those around him. Both stylistically and in their emotional tone of voice, the Romances mark the beginning of a new chapter in the story of this man's music. Within a short time after finishing them, Shostakovich, apparently swept forward on a creative flood even greater than even he had known before, embarked on the early sketches for one of his grandest and most popular works, the Fifth Symphony. And the careful listener to these songs will find that not only do they usher in the more general matter of their style (a new kind of harmony, a new way of making each phrase grow out of the one before) but that the first of them—Rebirth—actually provides a number of motifs and fragments which the composer then went on to quote in the symphony's last movement. Thus through the connection with the music of this little romance, Shostakovich was able to hide the words of Pushkin's passionate poem, a declaration of the power of art to survive barbarism and oppression, beneath the apparently 'purely' musical argument of his symphonic finale. At some point (we don't know when) Shostakovich made an orchestration of the first three songs of the cycle, using just a string orchestra, one clarinet and a harp. He kept this orchestral version of the work to himself; perhaps he was waiting for the moment to orchestrate the fourth song. A few years ago, when I first came across this unfinished cycle, it seemed to me a dreadful thing that his beautiful music should not be heard and performed. So, changing only the clarinet to the bass clarinet (to cope with the predominately lower registers), I have orchestrated the last song in a manner as close as possible to that of the first three. Blackens over a picture of genius. Visions of original, pure days. Shoulder, quite suddenly nodded off. And at him, letting flow quiet tears. Will I preserve my contempt for destiny? My angel, tor the last time. Softly whisper to me, Farewell! And courage of my young days. I constantly withdraw into my day dreams. And for someone or other that moment is already at hand. As it has outlived the age of our fathers. I find myself already thinking: Farewell! The time has come for me to wither, and for you to bloom. Will be the anniversary of my future death. In battle, on some journey or at sea? That receives by cooled ashes? As close as possible to the sweet familiar bounds. Glow with eternal beauty there.